I was reading Concierge Care’s website and noticed they had a link to an interesting website called Fitbrain– I had to check it out and after doing so- learned some interesting stuff! I knew games were fun for kids, but learned they can actually be beneficial to seniors. In our family we have a tradition- every Sunday night is Game Night. I make a casual dinner, usually soup, and the 4 of us sit around the kitchen table and play games- often times it’s dominoes. We started this tradition in order to spend quality time together as a family and also to show our children that we value spending time with them above anything else. But did you know that seniors can also benefit from playing games? At Capability Homecare, we believe that quality of life is the most important factor to a senior’s well-being and happiness. This is often achieved through interaction with others- and what better way to do that then by playing games? Games such as cards, bingo, dominoes, Trivial Pursuit, Wii bowling or tennis are all active and social games that stimulate social interaction as well as mental clarity. 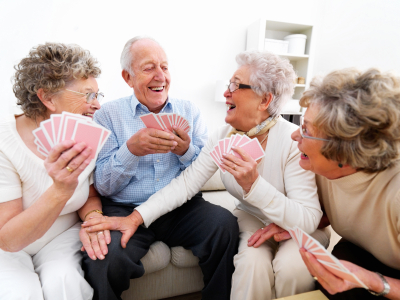 Many senior communities offer these type of games on a daily basis. For those seniors aging in place– encourage your children, grandchildren, or paid caregiver to play games with you. It’s actually for your health! For seniors who prefer to be alone- jigsaw puzzles, crossword puzzles, suduko and math problems are all excellent brain stimulators. There are also lots of computer based games that seniors can access easily, Click here to see and play some. According to the website, Boomers with Elderly parents, “The key idea behind mentally stimulating games is to slow down the degeneration of neurotransmitters and to increase growth of new brain cells”. Because Alzheimer’s runs in my family, I am committed to try anything I can do slow the process. What games do you enjoy playing?